Takeaway sandwich/soup/pie/salad/coffee shop with a constantly-rotating menu, located in the sub basement of Top Shop on Oxford Street. 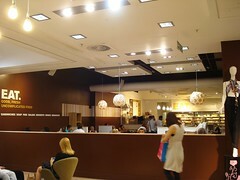 This branch is a concession located within the large Top Shop clothing store on Oxford Street. It is on level -2 and next to the refund desk. There is some seating and lots of noise from the adjoining Top Shop. secretlondon doesn't think there are lifts down here. Toilets are available as part of Top Shop but not checked. Last visited by secretlondon, March 2009. Last edited 2014-09-15 16:53:32 (version 7; diff). List all versions. Page last edited 2014-09-15 16:53:32 (version 7).